We were already mandated to locate a strategic investor before AlfaCelik fell into financial distress and had gone under bankruptcy protection. Due to our role at that time, financial restructuring of Alfa Sinai Yatirim (AlfaCelik) has been successfully completed by means of the investment from Zeman International (Zeman) based in Austria . 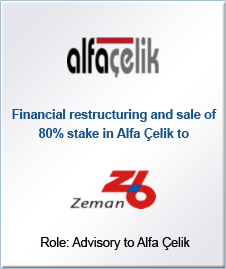 As a part of restructuring process, Zeman has paid all the debt of AlfaCelik at a discount to existing creditors and AlfaCelik reached a healthy financial structure. Established in 1999, AlfaCelik put design, production and erection groups together as a whole and builds steel structures with EPC capabilities. Since its foundation to the date of transaction, the Company had successfully completed over 150 constructional steelwork projects. 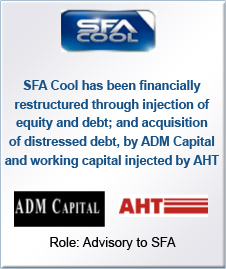 SFA Coolers completed its financial restructuring and emerged from bankruptcy protection by means of the investment from Hong Kong based, Asian Debt Management which acquired debt from the existing creditors at a discount, acquired shares of the Company, and provided additional long-term financing in the form of capital increase and debt financing. In addition to ADM, strategic partner of the Company, Austrian based AHT provided working capital financing to the Company and increased its technical support. SFA was a leading manufacturer of commercial refrigeration with revenues of more than EUR 50 mn, and an annual capacity of 350,000 units. 2 years later, SFA was sold to a strategic investor bringing substantial return to its investors as well as shareholders.